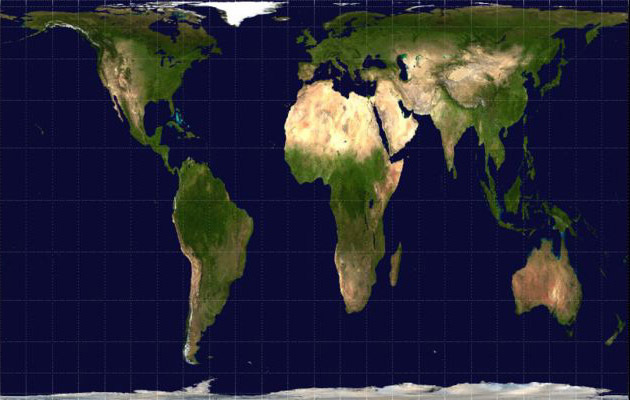 The Gall–Peters Projection shows countries in proportion to their relative sizes . It is based upon Arno Peter's decimal grid which divides the surface of the earth into 100 longitudinal fields of equal width and 1000 laditudinal fields of equal height. It treats rectangles around the equator as squares and builds the other rectangles onto these in proportion to the areas they represent. The zero meridian on this system is combined with a proposed new international date line. The traditional maps distorts the world to the advantage of The North, in actual fact is only half as large as The South, and on Mercator maps to be much larger. 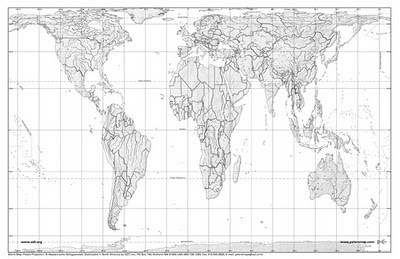 On the Mercator Map Europe appears larger than South America, and shows Alaska three times larger than Mexico even though Mexico is much larger. Russia appears twice as large as Africa, even though Africa is much larger. Greenland appears larger than China, even though China is four times as large. Scandanavia appears larger than India even though India is three times as large.